LaCreta Holland, owner of Happy Valley Learn to Cook and Local Food Journey contributor, is offering her cooking skills and expertise to teach students from the State College NHS school how to cook healthy and tasty after-school/weekend snacks. The NHS School provides educational programming for autistic students. They are partners with Penguin Packs, a weekend food backpack program started via a partnership between the State College Food Bank and the Faith United Church of Christ. While there are several farmers markets in this area that run year-round, the first day of outdoor farmers market season is always a reason for celebration. While the first few market sessions may be on the chilly side, it’s the promise of warmer days ahead and the great produce it brings that is a big reason for optimism. 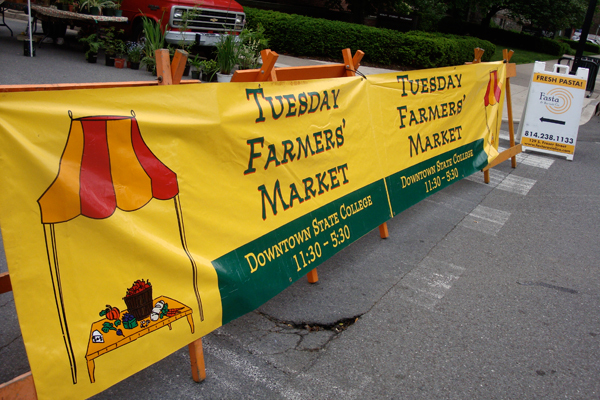 Two markets kick off their outdoor season today, the Tuesday Downtown State College one, and the Boalsburg version. The Boalsburg Farmers’ Market and Mt. 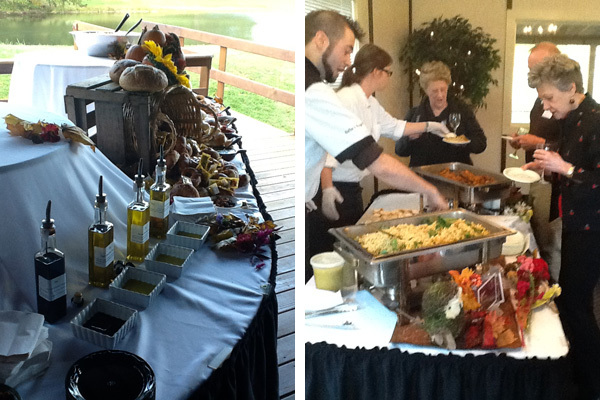 Nittany Winery present the fourth annual “Plow to Plate”. 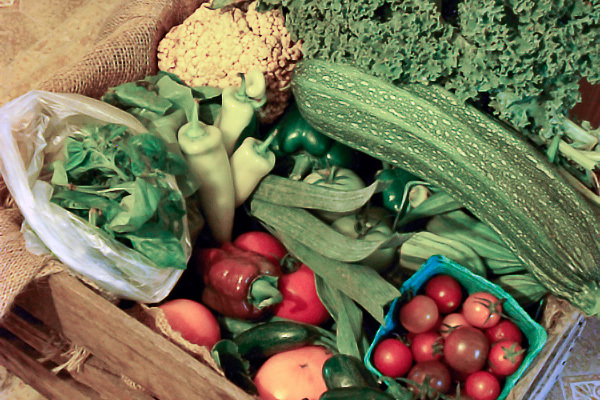 This local foods dinner is an evening to celebrate food, farmers, and community. There will be a variety of dishes prepared by our area’s best chefs from fresh ingredients obtained at the Boalsburg Farmers Market. Zola’s, Gigi’s and Webster’s chefs will all be there. Wednesday, August 26th from 5:00 p.m. to 7:30 p.m. at the Mt. Nittany Winery, 300 Houser Rd, Centre Hall, PA 16828. The cost for the dinner is $25 per ticket, with kids under 12 are free. Tickets are available at the Boalsburg Farmers Market and Webster’s Bookstore and Cafe. Last week at this time, I was one of several judges at the Boalsburg Farmers Market’s annual Golden Basket Awards. Among the chefs competing included Jeremiah McClanahan of Fasta & Ravioli Co.; Mike Benjamin of Benjamin’s Catering; last year’s champ, Kirsch McMaster of the Nittany Lion Inn; Andrew Hufnagel of Zola Kitchen & Wine Bar; a new-to-the-area chef, Erin Snyder, Elk Creek Cafe + Aleworks; and an established innovator in cuisine made with local ingredients, Harrison Schailey from Harrison’s Wine Grill & Catering. I know, tough job, trying all this amazing food made by talented chefs, using the freshest of local ingredients. We chose Chef Harrison as the overall winner, he made us a remarkable grilled filet of beef, with au gratin potatoes from Clan Stewart farm and a fantastic arugula and fresh corn salad. He also made his famous gazpacho; if you’ve never had it, I recommend getting it at your next visit to his restaurant. 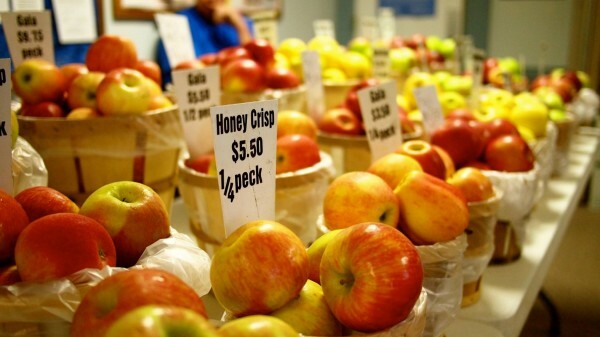 The fifth annual Golden Basket Awards will be held today, August 4, at the Boalsburg Farmers Market. The cooking will start at around 2:15 p.m. and the awards will be given out at around 4:30 p.m.
As always, the chefs will use ingredients found in the market. The event is designed to show off our local culinary creativity, and to inspire the local community to use local ingredients to create their own kitchen masterpieces. To help with the inspiration, there will be a limited supply of samples for market attendees to try. For your holiday dinners, it’s always good to try to serve local food. 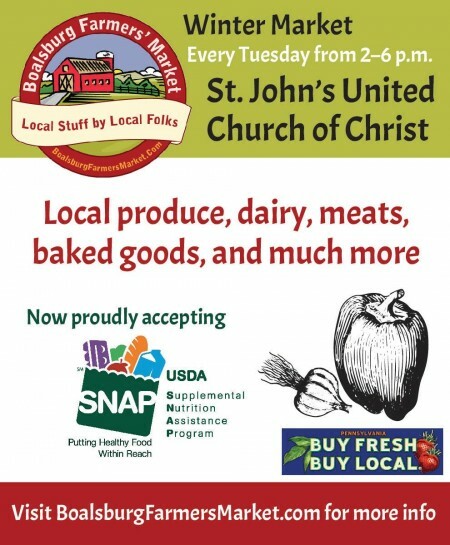 While it’s cold and gloomy and eating local produce is a lot harder to do than when it’s sunny and summery, but the Boalsburg Farmers Market is open today from 2:00 p.m. to 6:00 p.m. and has some local produce options. 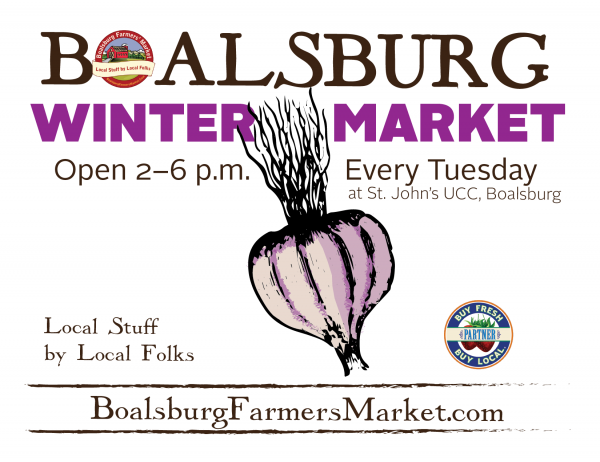 Melanie Rosenberger of the Boalsburg Farmers Market has shared with us two delicious side recipes to complement whatever holiday main dish you decide to make. 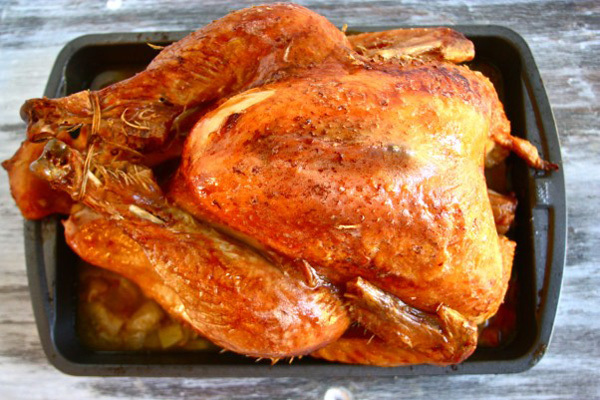 It’s likely a bit too late to get a local turkey if you already haven’t, but there are a lot of local food items that you can add to your Thanksgiving table. You still have time to head out and pick them out (although based on the weather forecast might want to do it before Wednesday). Fall in Central Pennsylvania brings the bounty, beauty, and variety of the late summer and fall harvest. To celebrate it, the Boalsburg Farmers Market in cooperation with the Mount Nittany Winery is sponsoring its “Plow to Plate Harvest Dinner” featuring the vegetables and fruits that ripen as the last of summer’s crops are replaced by those that thrive in the fall. Some of the best chefs in Happy Valley will prepare main dishes from sustainably produced local meat and poultry, soups and side dishes from tomatoes, eggplant, peppers, okra, garlic, onions, melons, acorn and butternut squash, pumpkins, kale, spinach, lettuce, fall greens, and apples. Guests will also enjoy a variety of wonderful deserts. 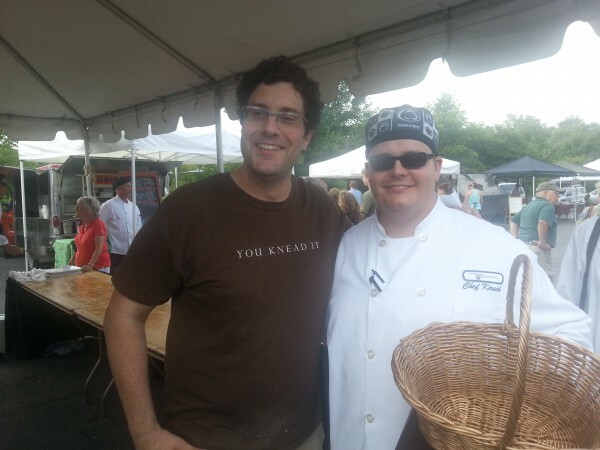 Nine of the best local chefs from Central Pennsylvania’s finest restaurants will compete for the Boalsburg Farmers Market Fourth Annual Golden Basket Award on Tuesday, Aug. 5, from 2:00 p.m. to 4:00 p.m. Part of Pennsylvania Association for Sustainable Agriculture (PASA)‘s “Local Foods Week,” the event will feature the chefs preparing a main dish and two sides from ingredients produced by Boalsburg Farmers Market vendors. This will be the largest judged competition among chefs in the State College Area, and it has been described “as the culinary Olympics of Centre County.” The chefs will gather their ingredients at the start of market, then prepare their plates for submission to the judges in front of market guests. Just about everybody knows the health benefits of eating fresh, local vegetables and fruits. But actually eating them is another matter. Often the reason for this is not knowing how to prepare them in creative and easy ways. To remedy this, The Boalsburg Farmers Market is sponsoring a “Vegetable Festable” on Tuesday, July 15 from 2:00 to 5:00 p.m. at the Boalsburg Farmers Market, located at the Pennsylvania Military Museum on Bus. Route 322 in Boalsburg. The event is designed to demonstrate how to use the fresh vegetables and fruits available at our local farmers markets and to inspire creative cooking at home. 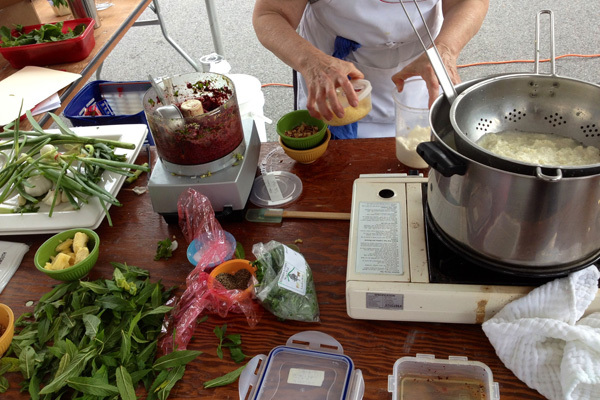 Three local chefs will demonstrate how to prepare dishes using fresh ingredients obtained at the Boalsburg Farmers Market on Tuesday, June 24. Mark Johnson, chef at Zola New World Bistro is sharing a pork rillettes recipe whose ingredients can be obtained at the market and that’s easy to replicate. He’s also demystifying pesto making using the wonderful seasonal herbs and produce available. Sc’Eric Horner (Fuji & Jade Garden restaurant) & Chris Young (Happy Valley Brewing) will demonstrate making “Cocktails from the Garden” using garden-fresh and local ingredients to create exciting summer drinks. The demonstrations begin at 2:00 p.m. at the market, which is located on the grounds of the Pennsylvania Military Museum on Bus. Route 322 (South Atherton Street) in Boalsburg. Winter certainly takes a toll on us here in Happy Valley. From below freezing temperatures to painfully bitter winds, winter weather conditions require us to adapt and prepare accordingly. While you may think that the months of December through March leave local farmers with little to harvest, this is not the case. In fact, farmers throughout Centre County are finding innovative ways to grow vegetables during the winter months, despite the chill that would typically inhibit certain plants to grow. Plus, you don’t have to look far to find these vegetables available to you, for they’re being sold every Tuesday at the Boalsburg Farmers Market! I recently was asked by the folks at the Boalsburg Farmers Market to serve as a judge for the Market’s Golden Basket Awards, an annual event held as part of Local Foods Week here in Centre County. 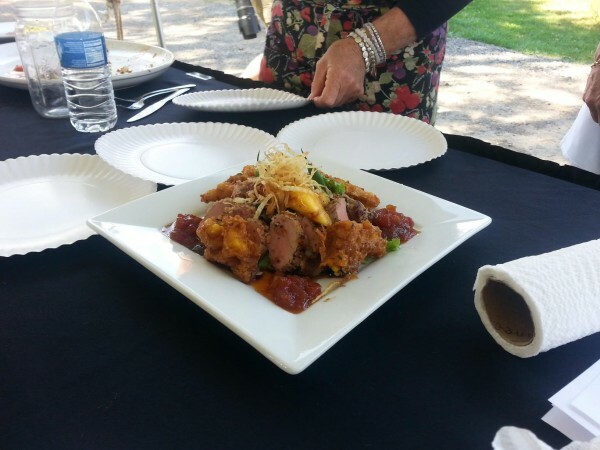 For those not familiar with the Golden Basket Awards, chefs from the local area compete for the prize by creating a full entree with ingredients found at the Boalsburg Farmers Market. Having to use local ingredients probably is the easy part of the contest. I mean, the chefs do their cooking in an area in the middle of the market and are surrounded by local meats, cheeses, eggs, dairy, sauces, and of course fresh produce. That’s a pretty formidable pantry. So, I got to judge their end result. It was a challenge to be presented with creative and delicious dishes made by professional chefs and then eat them, but I persevered. Seriously, though, the food coma I was in by the end of the event really was a bit of a challenge, but it was a happy feeling. Three local chefs will demonstrate how to prepare dishes using fresh ingredients obtained at the Boalsburg Farmers Market Tuesday, June 25 at 2:00 p.m. Mark Johnson, head chef at the Elk Creek Cafe, will showcase dinner ideas for entertaining friends and family, while Sc’Eric Horner and Chris Young (master cocktailians from the Fuji & Jade Garden restaurant) will demonstrate making “Cocktails from the Garden” using garden-fresh and local ingredients to create exciting summer drinks. 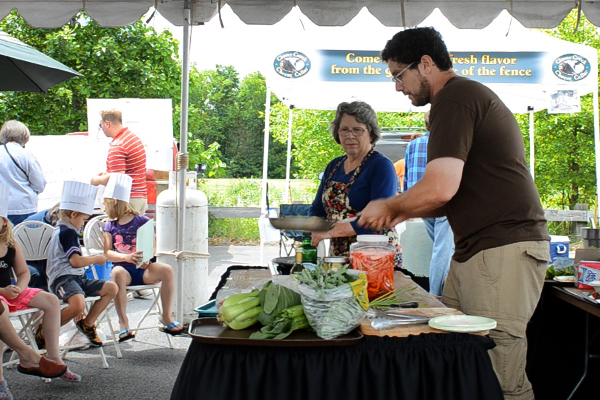 Children watched Tony Sapia of Gemelli Bakers demonstrate how to prepare local food at the Boalsburg Farmer’s Market during Tuesday’s Kid’s Day. They share their favorite food and other experiences at the farmer’s market.